It all started in 1978 when we introduced the first gourmet burger in Spokane. 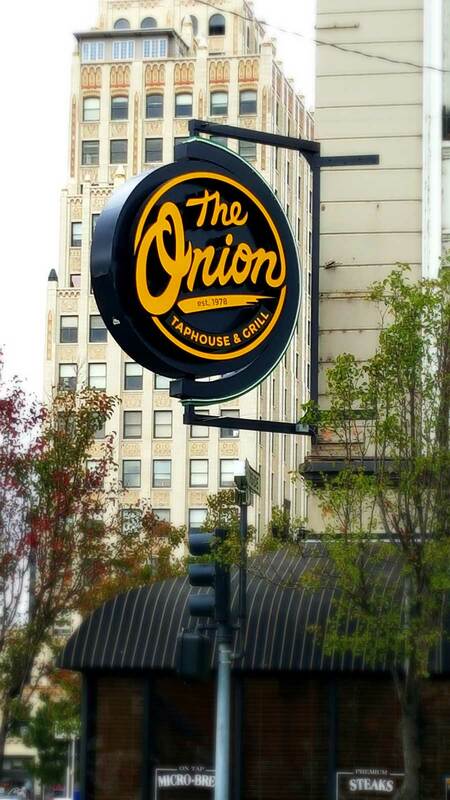 Our first menu had over 44 different kinds of exotic burgers and it took Spokane by storm. Today our menu has grown but our commitment to only using the finest ingredients, thoughtfully prepared fresh, by trained chef’s remains the same. We purchase local sustainable products and prepare field to fork as much as possible. We cook nearly everything from scratch and fresh daily. We use only Alaskan deep water cod, halibut and only wild Alaskan Salmon. We purchase 100% fresh local beef for our burgers and use local bakeries to prepare our amazing breads. Our commitment to quality includes cooking whole barons of beef and fresh turkeys off in our kitchens daily. Each year our owners and Chefs hand select over 80 tons of Ranger Russet potatoes during harvest to make our giant extra fancy steak fries. We cook them only in heart healthy 100% non-hydrogenated soy bean oil and we never use trans-fatty oil in our fryers. Our Chefs and General Managers are Serve Safe Certified which exceeds all federal guidelines for nutritional safety. If you have special dietary needs, please let us know. You and your family are the reason we are here. We value your thoughts and comments and would love to hear from you anytime. Thank you for making us a part of your day and we hope to see you again soon. The present bar area of The Onion was operated as a pharmacy until 1958 when W. G. Cassis took over. He moved the beautiful back bar in and opened the Union Tavern. Cassis sold to Bob Gillespie in 1966. Larry Brown purchased the Tavern from Bob Gillespie in 1974. 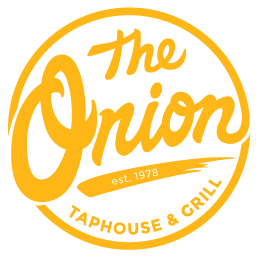 The present dining room space of The Onion was operated by the Petrus family as the Ideal Shoe Store continuously until the death of Albert Petrus in about 1977. Interestingly enough, Albert’s father had operated the Ideal Shoe Store across the street for 16 years before moving into this building in 1934. So they were doing business in the neighborhood from about 1918 until 1977. But…What about the back bar? The magnificent oak back bar is an original, built by the Brunswick Corporation in 1904. The bar was part of a complete set which included two matching glass door liquor cabinets, six horsehair booths and several elegant room dividers that include marble bases and beveled glass inserts. The entire set left Chicago somewhere prior to 1910 and was moved west. The set was broken up at that time and all parts except our front and back bar appear to currently be in the Montana Bar in Miles City, Montana. Our bar arrived in Spokane in 1910 and was installed in the Court Saloon, next door to the Spokane County Courthouse. Following prohibition the Levitch family still owned the bar and moved it with the same W. G. Cassis to the Union Tavern and Hotel, Cassis operated the Union Tavern on Trent from 1934 until 1958 when he moved the bar to its present location. He operated the Union Tavern for eight years at Bernard and Riverside and then in 1966 sold it to Robert Gillespie, who sold it to Larry Brown in 1974. In 1978 Larry opened Spokane’s first gourmet burgers and brew restaurant, and the rest is history! Life is about the journey – savor each moment! Downtown Onion at 302 W. Riverside – The beautifully restored 1937 Harley Davidson motorcycle was added to The Onion in the 1998 restoration. The bike came from the collection of Robert E. Smith of Coeur d’ Alene, Idaho. Larry Brown had it restored under the watchful eye of “Lucky” Lawrence of Lawrence’s Vintage Restorations, also of Coeur d’ Alene. The bike was running when it went in to Lawrence’s for restoration. North Spokane Onion at 7522 N. Division est. 1984 –The 1937 Harley was found in Canada in 2002 by Ken Belisle. It was running when he displayed it in 2003 at the North Division Onion. Why are the motorcycles displayed in our restaurants? Life is about the journey, not the destination! Savor each moment! We hope these vintage motorcycles will remind all of us to savor the moment while enjoying a meal with families and friends. Both bikes are Model UL, 74 cubic inch (1200cc) V Twin engine with cast iron “flathead” heads and off the handle shifters. There were 2,861 of the bikes produced at a base price of $395.00 each. The preceding information was provided by Larry Brown and Ken Belisle.